Add spices, sugar, salt, and cinnamon stick to water and cook over high heat until the salt and sugar have dissolved, then remove from heat, add ice and clams with juice and refrigerate overnight. Place potatoes in a pot with 1 quart of cold water and bring to a boil, then immediately remove from heat and drain. In a wide sauté pan, cook potatoes over medium-high heat in olive oil until tender and lightly caramelized, then add clams and cook an additional 5 minutes or until all moisture evaporates. 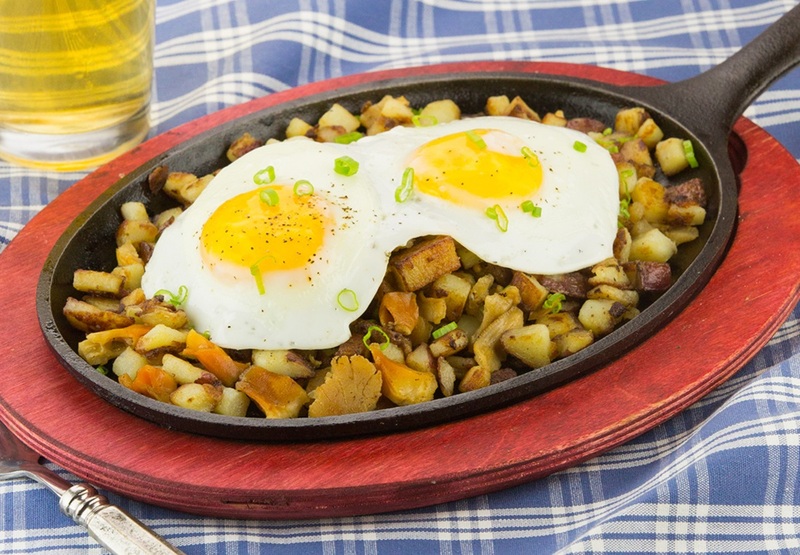 Place a portion of hash on each plate and top with fried eggs then serve immediately, garnished with scallion if desired.